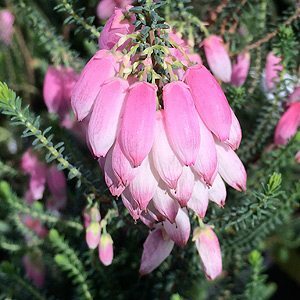 A small evergreen shrub from South Africa Erica baueri is commonly called the ‘Bridal Heath’. Very showy, tubular flowers, in large clusters appear from mid winter to spring and often a second flush in summer as well. The colours vary from white through to pink and red with many new cultivars being released. This is a reliable flowering evergreen plant, attractive foliage and a easy care. Most cultivars will reach around 1m in height. Plants are readily available for sale from nurseries and garden centres. Best suited to a sunny well drained position. This is a plant that resents root disturbance, so avoid transplanting once established and do not cultivate around the plant. Pruning can be carried out immediately after flowering, cut back by 1/3 or a little more. This will maintain a good bushy habit and promote flowering for the next season.